BNL plastic bearings are designed and manufactured to exhibit optimum performance in a wide variety of customer applications. If you wish to discuss your specific application requirements please contact us using the inquiry form below. The life of a bearing is affected by it’s environment, the load it must carry, the speed it operates at, plus how much these vary across its service life. Plastic bearings are affected in different ways by these different conditions. A plastic bearing can carry heavy loads, reach high speeds and is suitable for many unique and severe environments. However, as shown in the diagram below, if an application is exposed to more than one of these factors, the potential life of the bearing can be affected. 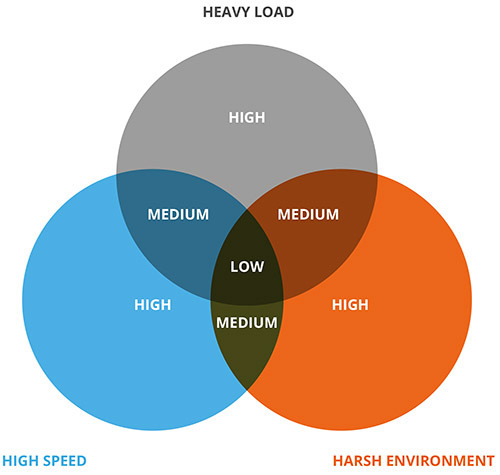 The diagram shows the suitability of plastic bearings where load, speed and environment are all factors. Each factor is shown as a colored circle. Where they intersect the operating conditions include more than one factor and the suitability is shown as High, Medium or Low. BNL’s unique tool design and processing technology enables us to design and manufacture bearings with molded raceways, which outperform machined equivalent products and deliver longer life. A fine crystalline layer is achieved in the molding process that increases bearing life. 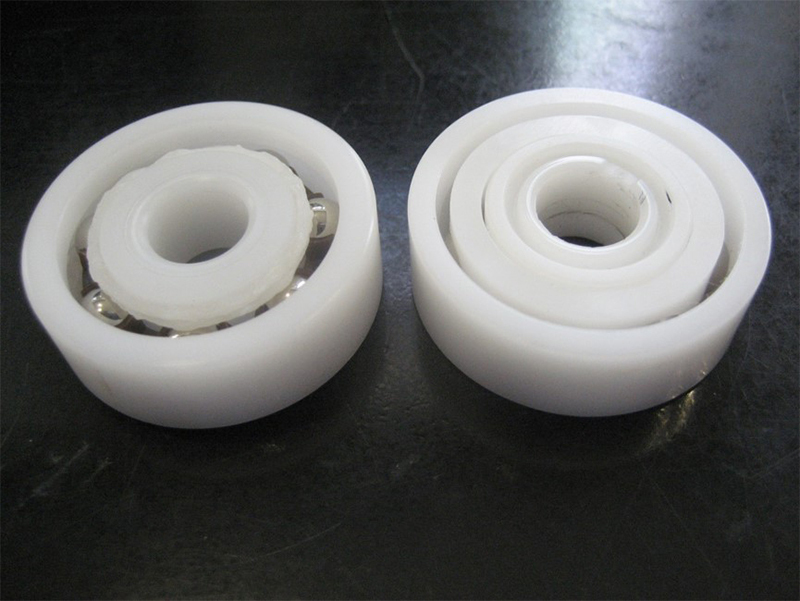 Machined plastic bearings or those that are molded and the raceways machined after, do not have or remove this crystalline layer and the bearing loses the benefit of improved wear rates. Our industry standard bearings have benefited from a redesign to improve load carrying capability and benefit from our unique manufacturing process that allows us to equip each bearing with a hardened crystalline layer, improving wear rates and life expectancy. selection, decades of product knowledge and design expertise to manufacture bearings that outperform other plastic bearings on the market today. 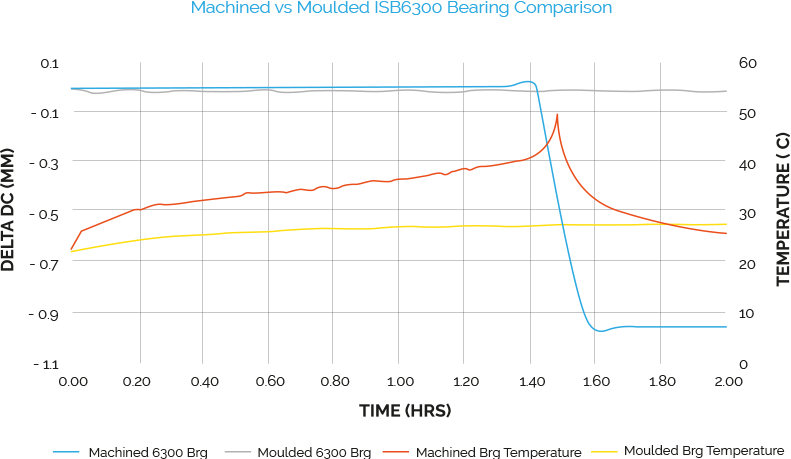 We tested our molded bearings against a popular machined bearing currently on the market. 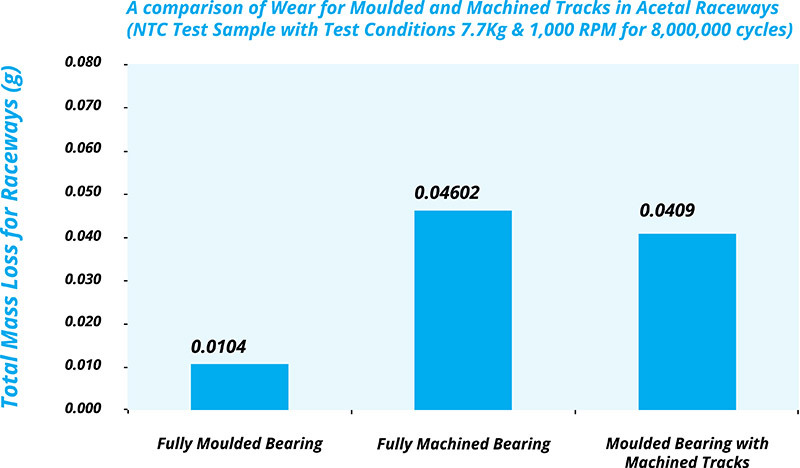 A machined 6300 series bearing was tested under the same conditions as a BNL fully molded 6300 series bearing. BNL's molded bearing remained a constant temperature and DC, the machined bearing began to wear much faster, generating more heat. After 1.5 hours and 90 thousand revolutions the inner raceway of the machined plastic bearing melted and the bearing failed. BNL's bearing completed the test. We also compared wear of molded bearings and molded bearings with machined tracks using mass loss. 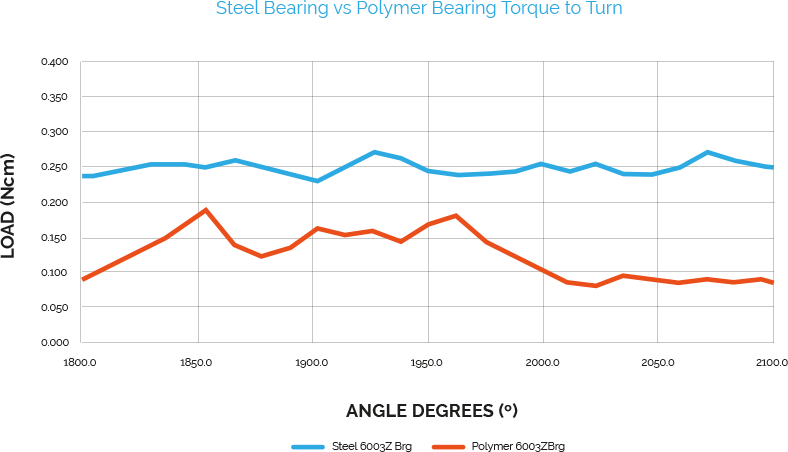 As seen in the graph above, the fully molded BNL bearing has a much better wear rate than those manufactured using machining methods. Our plastic bearings are lightweight and need no grease to operate smoothly and efficiently, so have a lower torque to rotate than an equivalent steel bearing. This means our bearings use less power at start-up and during operation, allowing our customers to choose smaller and less expensive motors for their systems and also assisting in lessening energy usage. Our industry standard bearings come in acetal with 420 balls as standard. Acetal is a widely used engineering plastic that is dimensionally stable when subjected to a range of loads, temperature fluctuation and fluids. 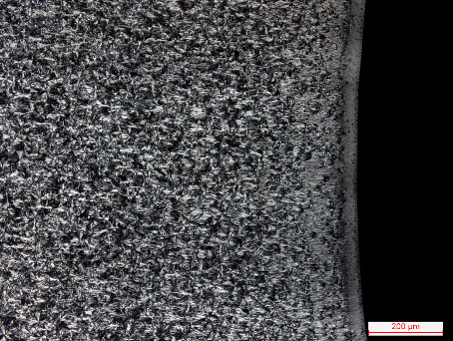 It has excellent abrasion and fatigue resistance and low moisture absorption. It has a low co-efficient of friction delivering good long-term wear performance. Stainless steel balls offer excellent corrosion resistance. The SS420 ball is resistant to steam, oil, alcohol, ammonia, and mildly acidic environments. It is magnetic. More information on the materials used in our industry standard bearings can be found in the downloadable pdf document below. Download our datasheet for our industry standard bearings range below.